Synopsis: The Sopranos is recognized as the most successful cable series in the history of television. The Washington Post has called the popular series, winner of twenty-one Emmys and five Golden Globes, "the television landmark that leaves other landmarks in the dust." In every aspect―narrative structure, visual artistry, writing, intertextuality, ensemble acting, controversial themes, dark humor, and unflinching examinations of American life―The Sopranos has had few equals. 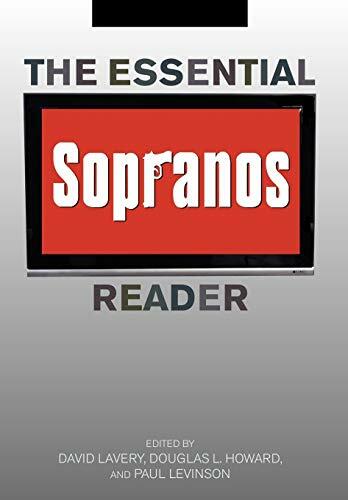 Offering a definitive final assessment of the series, The Essential Sopranos Reader aims to comprehensively examine the show's themes and enduring cultural significance. Gender and ethnicity, the role of dreams, the rebirth of HBO, the series' controversial finale, and other topics come under scrutiny in this highly accessible, engaging collection. The book concludes with an interview with Dominic Chianese, who played Uncle Junior in all six seasons of the show. About the Author&colon; David Lavery, professor of English at Middle Tennessee State University, is the editor of The Essential Cult TV Reader. He lives in Murfreesboro, Tennessee. Douglas L. Howard, assistant academic chair and associate professor in the English Department at Suffolk County Community College, is the editor of Dexter: Investigating Cutting Edge Television. He lives in Plainview, New York. Paul Levinson, professor of communication and media studies at Fordham University, is the award-winning author of five science fiction novels as well as ten books on new media. He lives in White Plains, New York. Lavery, David, Douglas L. Howard, and Paul Levinson, eds.